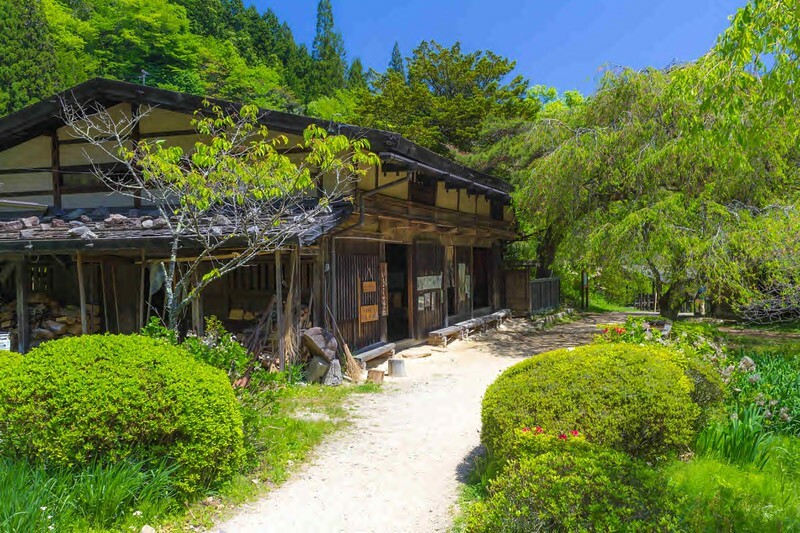 The most beautiful stretch of the Nakasendo, the ancient inland highway between Kyoto and Tokyo is undoubtedly the stretch between Magome and Tsumago, two old post stations that have remained remarkably intact. It was halfway between Magome and Tsunago that I passed a teahouse. It was a traditional one, maintained in its original state by the township of Tsumago. Halfway teahouses were a common feature in feudal Japan. Situated midway between the main post stations, they offered nourishment, rest and temporary shelter to the weary traveler. The caretaker was Matsubara-san, a middle-aged man dressed in the traditional dress of the teahouse keeper, a large character for cha (tea) emblazoned on the back of his blue haori. He inquired about my journey, and soon we were talking about the old times. Then the average traveler, he told me, clocked some forty kilometers a day. At that pace it took them only two weeks to walk from Kyoto to the then capital of Edo (modern-day Tokyo). For the daimyō (feudal lords) and their large retinues it took longer. Under the Bakufu system of alternate attendance, they were required to spend one year in the capital Edo and the next year at home in their domain. Their spouses and children, meanwhile, would spend that year on the opposite side, virtual hostages of the Bakufu. By this ingenious system called sankin kōtai the Tokugawa shoguns ensured the loyalty of those who had fought against them in the great unifying Battle of Sekigahara of 1600. Travelling by palanquin, their greatest obstacles were the many rivers. It was a deliberate strategy of the shogunate, Matsubara-san explained, not to build any bridges across the great rivers that had to be crossed to reach the capital, so as to prevent any rebellious army from reaching Edo before the shogunate could take military precautions. And while the Bakufu allowed the use of ferries on wide waters like the Tama and Fuji Rivers, it forbade their use on other rivers. To cross these, travelers had to rely on so-called kawagoshi ninsoku, an army of laborers whose work it was to carry travelers and their luggage safely across the river. The fee they charged would rise with water levels. During the rainy seasons, when rivers grew too wide to be crossed, they would declare a kawadome, or ‘river stop,’ This meant that travelers were delayed for days, even weeks, forcing them to stay and dish out even more money on lodgings and food at the nearby post station. At this stage in Matsubara’s account, a young couple entered the teahouse. They, too, sat down for some tea and began talking to each other, in Dutch, so I said hello. They introduced themselves as Colette and Peter. They were traveling around Japan and due to return to Holland in a few days. They were a pleasant couple, easygoing and full of questions. I told them about my journey and they seemed impressed. Had I traveled a lot, they asked. I told them that the last time I had visited I had spent two month traveling the length of the country to photograph its many castles. They seemed slightly amused. Was I perhaps from the north of Holland? I said yes. Could they tell by my accent? Not so much the accent, they said, inasmuch that I had dropped the Dutch equivalent of the plural ‘s’ in ‘months;’ like most northerners I had said ‘two month,’ instead of ‘two months.’ They had both studied at my hometown university of Groningen, she labor law and he criminal law—it was how they had met. Living for several years up in the north they first noted how the locals had a tendency to swallow their plurals. We laughed; I clearly couldn’t escape my roots. She gave me her email address, asking me to let her know when the book would go on sale. I said I would, assuring them they could have a signed copy If they were willing to represent me at court if ever I ran into trouble. We laughed some more and shook hands as we parted. Teahouse appears in William de lange’s latest book, A Fool’s Journey: Walking Japan’s Inland Route in Search of a Notion. William de Lange is a Japanologist with more than three decades of experience in Japan. He has written a number of books on Japan, ranging from dictionaries, history, to (martial) arts. Check out his work at: www.williamdelange.com.